Maisons closes. Bordels. Femmes de la nuit. Cette excursion de 2 heures à pied vous emmène dans la partie la moins connue de l'histoire du quartier français de la Nouvelle-Orléans. Évitez les endroits touristiques tandis que vous découvrez la région, et arrêtez-vous pour les rafraîchissements adultes classiques de la Nouvelle-Orléans dans des tasses à emporter. Commençant près de la rivière et se terminant près de l'arrière de la ville, cette visite en petit groupe met en lumière le sort des femmes qui travaillent dans le plus vieux métier du monde. Karen was amazing! So knowledgeable and a killer photographer :). You will learn so much about New Orleans while having the best time. Highly recommended! The owner of the company was our guide, and she is excellent! VERY knowledgeable about New Orleans. The topic was well explained, and the stops were very appropriate. Christine was a knowledgeable and personable guide and the tour was good fun. very interesting and different view of New Orleans. The last stop was the Bombay Club, which was great. Brought a group of friends for a bachelor party and we had a great time. So good, in fact, that we just kept following Christine when the tour was over because we didn't realize it was over! Highly recommended and a great overview of the history of the French Quarter, New Orleans. Interesting, informative and well conducted. We have recommender this activity to friends going to New Orleans in near future. I'm glad we took this tour. It added a few concrete, historical tidbits to our wanderings. I will say, however, we were a bit disappointed in the content and our ability to access all of what was said. I was really looking for more history and more a pithy experience. Because we were 13 people walking in a string along the sidewalk we couldn't always hear what was said. Periodically Christine did stop and allow us to gather around her but I would have felt far better fed if we had been provided with head phones and more of an audible running commentary. In addition we spent an inordinate amount of time in two bars. Just one for ordering a drink and using the facilities, would have been sufficient. The idea was cute, the actual tour was disappointing. 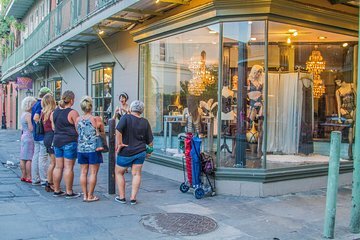 This is a great tour for seeing the lesser known sites throughout the French Quarter.... plus you have stops for cocktails or water if you're not into drinking. Our guide, and one of the Two Chicks, was extremely knowledgeable and very entertaining. I would recommend you take this tour and be prepared get a fun history lesson and learn about the city.